This post provide you the step by step procedure of how to create our local docker registry to manage docker images from a centralized server rather then getting the docker images from hub.docker.com through internet. When you have large number of docker hosts in your environment, Creating our own private docker registry within our internal network helps us to manage docker images from a centralized server also no need to provide internet access to all docker hosts. Instead we can use our internal docker registry to pull or push docker images. There is a container available for docker registry for this purpose, it can be used within docker host to setting up our private docker registry. In the previous posts, already we have explained the below topics. Refer those links to understand this topic from basics. Also You can Watch this Tutorial video on our YouTube Channel. 1. Create a certificate directory "/docker_data/certs/" to hold the TLS certificate. 2. Generate a SSL/TLS certificate to secure our private docker registry. 3. Create a directory to store docker images "/docker_data/images". 4. Run a docker registry container in docker host "docker-registry". 5. Pull required docker images to docker host "docker-registry" from docker hub. 6. Push those downloaded docker images to docker registry container. 7. Remove old docker images from local docker host. 8. Configure all docker clients to use our certificate. 9. Docker clients can Pull and push docker images in our private docker registry. Internet Required: Yes, only on docker registry server to pull docker images. 2. Generate a SSL/TLS certificate to secure our docker registry. Generate a certificate to secure our docker registry using the command "openssl". If "openssl" command is not found, please install the package "openssl" using yum repository as below. Refer this link if you dont know how to configure local yum server. Once "openssl" package is installed, generate the certificates. Its not mandatory to fill all fields, but replace the common name "docker-registry.learnitguide.net" with your valid server hostname. Create a directory "/docker_data/images" in docker host and same directory will be mounted as a volume "/var/lib/registry" to registry container. Because "var/lib/registry" is the directory where all docker images are stored when we push and pull docker images to private docker registry. So this volume must have sufficient free space to store the docker images. If we provide this volume from docker host, we have lot of options to extend this volume in future based on the utilization. We must have docker tool installed already to run the local docker registry. Else refer our previous article to know how to install docker on linux servers and make it ready. Once you have installed docker on your docker host, run a container with readily available docker registry image from docker hub as below. -p 5000:5000 - Registry running on 5000 port in docker container and exposes it to 5000 in docker host. -v /docker_data/certs:/certs - Mounting the Certs directory created in docker host to docker registry. -v /docker_data/images:/var/lib/registry - Mounting a directory to store docker images from docker host to docker container. because, all docker images are stored in directory "/var/lib/registry" within docker registry container. -e REGISTRY_HTTP_TLS_KEY=/certs/domain.key - Assinging a variable TLS key to use /certs/domain.key. --restart on-failure - Docker container will restart in case of any failures. --name myregistry - Name of the container. docker.io/registry - Image Name of docker registry. Check the status of the newly created docker container. Docker registry container is running on port "5000". For example, Let's say we need httpd and nginx docker images. Verify the downloaded docker images. 6. Push docker images to docker registry container. We must rename it, before pushing those downloaded docker images to our private docker registry server. List out the docker images. Now Push the newly tagged docker images to docker registry container. Checkout the list of docker images pushed to our private docker registry. First copy the generated certificate "/docker_data/certs/domain.crt" to all docker clients as below. Login into each docker clients and create a directory "docker-registry.learnitguide.net:5000" under the directory "/etc/docker/certs.d". 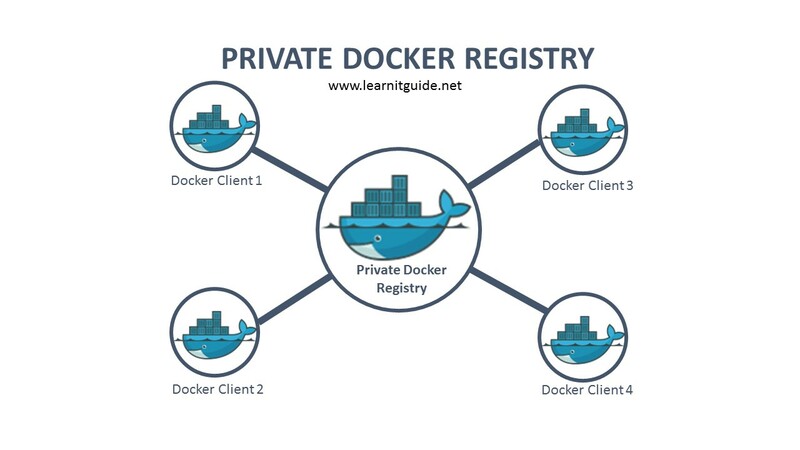 Replace "docker-registry.learnitguide.net:5000" with your docker registry server name with port number. Now copy "domain.crt" certificate from your "/root" directory to this directory, so our docker clients would use this TLS certificate to avoid certificate issues. Now we can Pull and push docker images using our own docker registry. Similarly, we can push any docker images to our docker registry server using the below command. Hope you have got an idea how to create our own private docker registry. Going forward we will play more with docker tool. Keep practicing and have fun. Leave your comments if any.